Discover practical, beautiful home decor solutions from Glass Doctor® of Amarillo. Our keen attention to detail and individualized service delivers one-of-a-kind enhancements that increase the functionality, appearance, and value of your home furnishings. If you want to redo tired home decor or protect particular pieces, we recommend you invest in custom glass tabletops. Exceptionally crafted furniture isn’t easy to find or replace. Moreover, the items in your home often represents a great story. Perhaps you have an antique dining room set your grandparents once owned that you hope to pass on to your children. Protect pieces like this with exclusively crafted glass coverings that allow the character of the wood shine through, rather than using cloths that hide their beauty. Our custom glass tabletops and interior glass options protect the valuable finish and surfaces of your collectible and heirloom furniture, while making clean-up a breeze. Our glass specialists possess years of experience and are able to assist you with intelligent design, placement and decorating ideas. We understand your home is a reflection of who you are and deliver custom interior glass options that are uniquely fitted to your personal style. Our courteous, knowledgeable experts provide detailed information about custom glass tabletops, shelving, mirrors and cabinetry door glass applications. We offer design solutions that fit your decorating, construction and budgeting constraints. During your free, in-home consultation, we’ll listen to your ideas and work hard to deliver the results you’ve envisioned for your home. Plus, our comprehensive, up-front pricing ensures there are no surprise costs when the work is completed. Size and shape: Specify the shape of your custom tabletop, including freeform designs. Our experts ensure that sizing measurements are accurate. 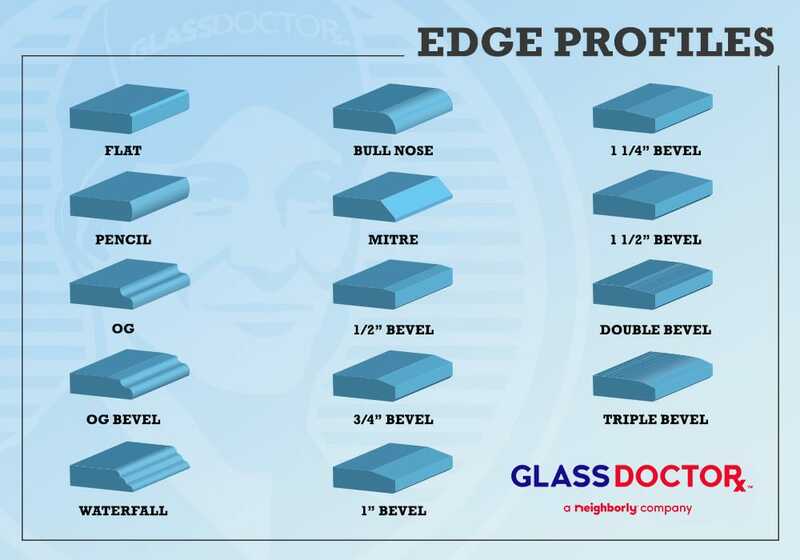 Edge profiles: Our expansive selection of designs allows you to create eye-catching edges that accentuate the beauty of your furniture with a subtle enhancement. Glass tints: Tinting ensures that harmful ultra-violet rays won’t spoil the finish of your wood by fading it, and may be applied to shelves and cabinets to coordinate existing design schemes. Impact-resistant and safety: Load-bearing shelf weight and similar safety concerns are addressed before the work is performed. Whether you aim to update your home decor, protect your furniture or build an original addition to your home, give your imagination free reign with our custom glass services. Contact Glass Doctor of Amarillo to arrange your in-home consultation today.